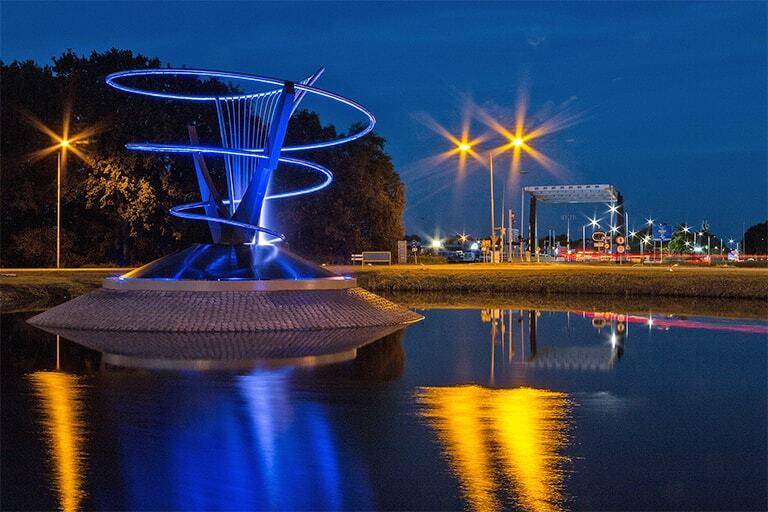 The Municipality of Veendam, Holland, has recently installed a statue by the artist Rob Oost in the center of the new roundabout built at the entrance to the city, after the works aimed at improve and maintain the road network. 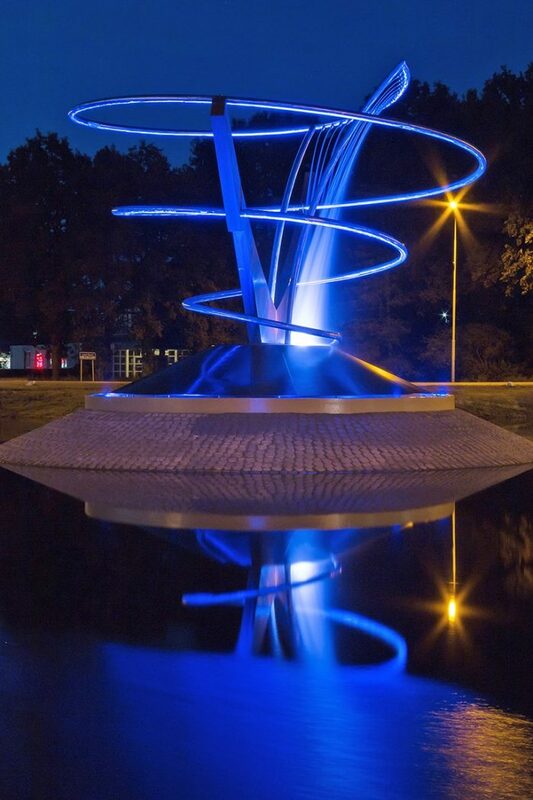 The statue – christened Lloydsplein Veendam – set within a large water pool – is lit at night by DTS’ DIVE 6 FC underwater LED projectors. 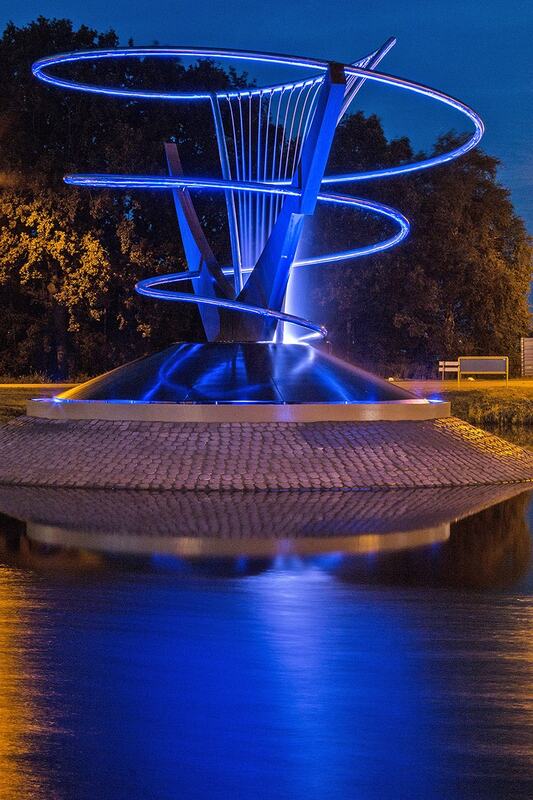 Fonteintechniek Gruppen from Hoogeveen was entrusted with the installation of water technology and LED lighting. As regular users of DTS products, they asked Full AVL Distribution to issue an advice on how to make the statue stand out since dusk. The solution was to install a network of DIVE 6, full-color IP68-rated LED fixtures, remotely powered by a DRIVENET 1664 24Vdc LED controller. 10 DIVE units (40° lenses) have been encased round the statue base, and 4 more units (10° lenses) in the center. The DRIVENET was set in a technical room situated in a basement under the waterline. 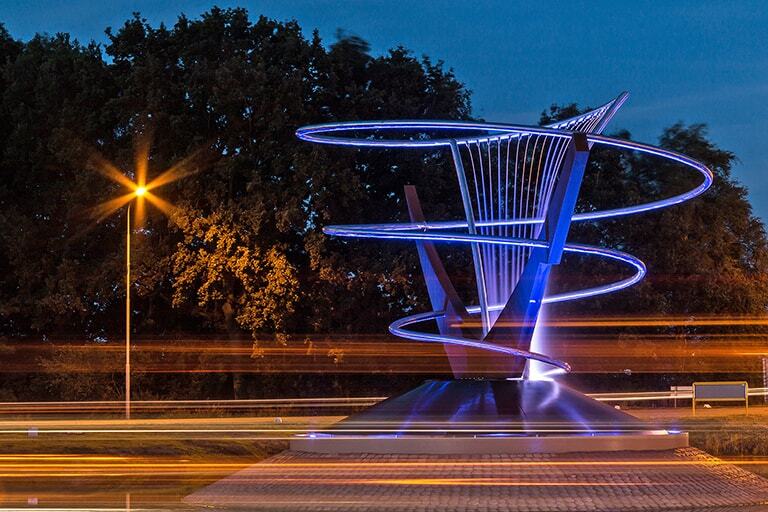 The result of the lighting installation was even better than anticipated: the eye-catching Lloydsplein Veendam, graced by the color projections of the DIVEs, turned a traffic hub into an unexpected art setting. The artwork by Rob Oost consists of two columns of corten steel – symbolizing Ooster and Westerdiep (two Dutch water management regions) that embrace a spiral of stainless steel from which water falls.